Oh no, Santa’s sleigh has broken down and he needs your help. It’s time to step up and deliver his presents in our drone-tastic event this Christmas. Get your woolly gloves on and learn how to build your very own drone with the help of our experts. Once you’ve made your final touches, it’s time to race against your colleagues in your custom made obstacle race. 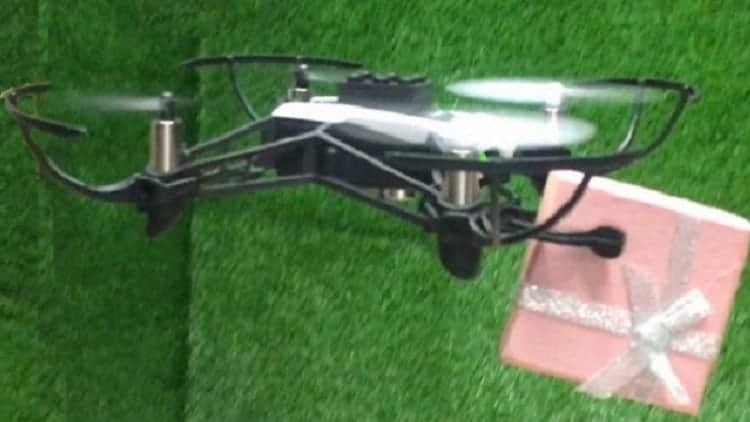 Deliver your presents in style whilst guiding your drone around houses and other obstacles en route. This event is perfect for your Christmas Party. Are you ready for our Team Tactics Drone Academy? With the help of our trained drone experts, configure your drone so it’s race-fit and ready to deliver all your presents. Starting with all the loose components, you’ll make sure your team is ready for take-off. Our experts will teach you the basics of aeronautics which will set you on the right path to fly you to victory. Time to buckle up, it’s almost time for take-off. Our pilots will brief you on the rules of the race and teach you tips and tricks to give your team the best possible flight time. Get some experience in the arena making sure everyone knows their role in the team, time will fly when the race has started, so it’s best to be prepared. But be aware, you only have two chances to perfect your flight skills, so don’t waste an opportunity, we’re watching! If you thought it would be a simple pick up and drop off, you’d be wrong. Your team will be challengedto create an obstacle course that’ll test your flying skills to the max. Hoops, tubes and flags will all slow you down, so it’s your choice whether you want to make it difficult or easy for the pilots. It’s time to race. If you think the building and constructing was difficult, then think again. Each person will fly their drone around the obstacle course and drop as many presents in their designated chimneys. Make sure you don’t hit any of the chimneys, Santa will be awarding penalty points for any houses which are damaged. Are you ready to take on our drone-tastic challenge this Christmas? If so, then check out our Santa’s Drone Drop page. Alternatively, if you need more Christmas party activity ideas then browse our Christmas page or Contact us for more info.